It was raining and chilly today, with a brisk wind. I wore a cap to keep the rain off my glasses. At first, I wished I had also worn my gloves, but during the second mile my hands warmed. (I walk fast, almost four miles per hour, to keep the workout aerobic.) On days like this, I carry the camera in a zip-lock sandwich bag, removing it only when I see something interesting. 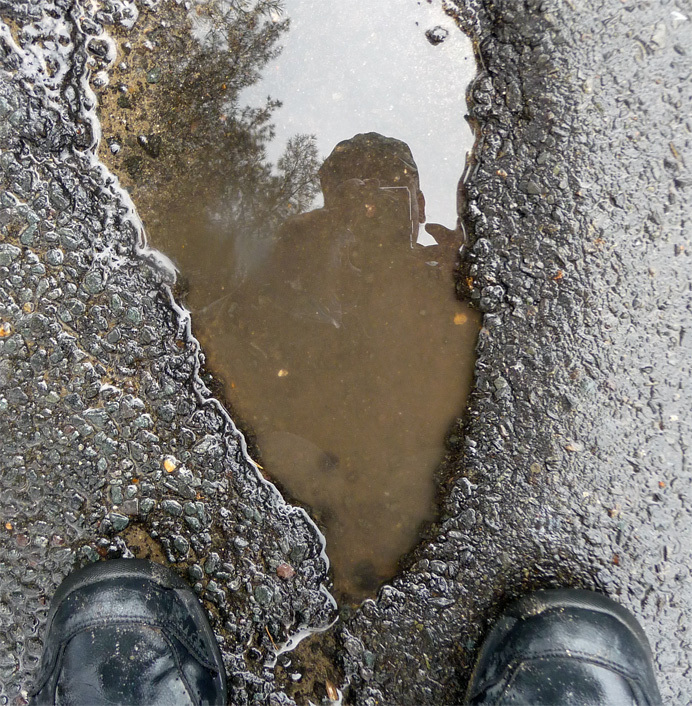 Coming up the King Street hill, I noticed my reflection in this pothole, one of many that pock the macadam here each spring. I decided to make a self-portrait. Looking at the puddle in my viewfinder, I was suddenly reminded of an elliptical girandole with an ornately carved ebony frame that hung in my grandmother's parlor when I was a boy. My grandfather had bought the convex mirror somewhere in France during World War I. Under the girandole sat an overstuffed chair upholstered in horsehair, probably scavenged from the Dunkle Hotel that my great-grandfather ran in nearby Jersey Shore, Pa. The hotel, which degenerated into a boarding house after it left the family, was razed a few years ago to make room for an Arby's Roast Beef. When I was four or five, I used to climb onto the chair and stand up, precariously balancing myself on the springs twanging inside the cushion, and study my face in the girandole. I was amused by the bulging perspective that the domed mirror conferred on my nose and cheeks. Here in the pothole, 55 years later, although the mirror is flat, my cheeks are again bulging. Like so many DietPower customers, I need to lose weight. This means, I guess, that I shouldn't eat Arby's Roast Beef. But I never liked it anyway. I worked part-time at an Arby's in State College, Pa., during some of my university years. There, I learned that the beef in an Arby's sandwich was sliced not from a real roast, but from a roast-shaped artifice made of ground beef mixed with something that the package called "binders." I wonder if Horsey Sauce has anything to do with horsehair.